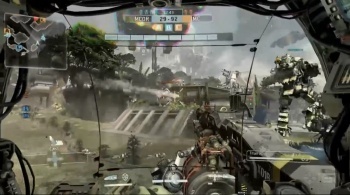 Titanfall will support sniping, but won't be the same as your typical shooter. While Respawn Entertainment is comprised of former developers that created Call of Duty, that doesn't mean the studio will be relying on shooter tropes for its debut project, Titanfall. Posting on the official Titanfall forums, Respawn developer "scriptacus" has confirmed sniping will be in the game, but "quick-scoping" and "no-scoping" won't be as effective as they are in your typical military shooter. Sniping is in the game, but due to how the game plays it's a pretty different animal than you'll find in your run of the mill modern military shooter. Quick scoping and no scoping are ineffective. For those unfamiliar with the term, quick-scoping is when a player quickly presses the "ADS" (aim down sight) button, and without locking on to your target, fire your sniper rifle just like you would a shotgun. No scoping is a bit harder, since it requires the player to rely solely on the crosshairs of their gun while it's not in ADS mode to hit their enemy. Both methods of sniping have been exploited by countless multiplayer users and can mostly be seen in your typical Call of Duty or Battlefield montage. Even if players somehow find a way to quick and no-scope in Titanfall, I imagine it won't be as effective, since players can run across walls and navigate the environment faster compared to your typical shooter. Add the game's Titans into the mix and that further complicates matters for snipers. Speaking of Titans, Respawn unveiled the "Ogre" and "Stryder" models at VGX, and just last week showed off the "Atlas" mechs that players can use in the game. Will Respawn succeed where other shooters failed when it comes to sniping? We'll know for sure once Titanfall hits the Xbox 360, Xbox One and PC on March 11, 2014.